Summa Theologiae, pars secunda, prima pars. 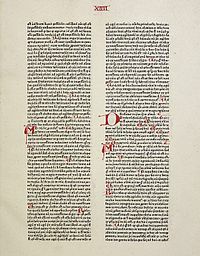 Exemplar a Petro Schöffer factum, 1471. Victoria Sancti Thomae Aquinatis. Pictura a Benotio Gozzoli facta, 1471. Lutetiae: Museum Lupariense. Thomismus est schola philosophica quae nata est ex hereditate operis et cogitationis Sancti Thomae Aquinatis (1225–1274), philosophi, theologi, et doctoris ecclesiae. In philosophia, eius commentarii de Aristotele fortasse sunt eius opera philosophica notissima. In theologia, eius Summa Theologiae est unum ex instrumentis maximi momenti in theologia mediaevali, resque manet gravissima in philosophia et theologia Ecclesiae Catholicae. Berger, David. 2001. Thomismus: Große Leitmotive der thomistischen Synthese und ihre Aktualität für die Gegenwart. Coloniae: Books on Demand. ISBN 3831116202. Berger, David, et Jörgen Vijgen, eds. 2006. Thomistenlexikon. Bonnae: Nova & Vetera. ISBN 9783936741377. Bor, Jan. et Errit Petersma, eds. 1995. Illustrierte Geschichte der Philosophie. Bernae, Monaci, Vindobonae: Scherz Verlag. ISBN 3502150575. Cessario, Romanus. 2005. A Short History of Thomism. Vasingtoniae: The Catholic University of America Press. Garrigou-Lagrange, Réginald. 2013. The Essence & Topicality of Thomism. ISBN 9781304416186. Gilson, Etienne. 1948. Le Thomisme: Introduction à la philosophie de Saint Thomas d'Aquin. Coll. Etudes de philosophie médiévale, 1. Lutetiae: Librairie J. Vrin. Kennedy, Leonard A. 1987. A catalogue of Thomists, 1270-1900. Houston Texiae: Center for Thomistic Studies, University of St. Thomas. ISBN 026800763-2. McInerny, Ralph. 1968. Thomism in an age of renewal. Londinii: University of Notre Dame Press. Paterson, Craig, ed. 2006. Analytical Thomism: traditions in dialogue. Aldershot: Ashgate. ISBN 9780754634386. Steenberghen, Fernand van. 1983. Le Thomisme. Que sais-je? 587. Lutetiae: Presses Universitaires de France. ISBN 2130377491.